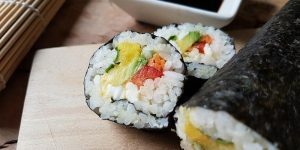 New Leaf Community Markets in Santa Cruz has several upcoming events, including classes on making sushi, learning about Japanese fermented foods, and identifying what foods cause inflammation. Here are some highlights; these are all at the Westside Santa Cruz location at 1101 Fair Ave. (831-426-1306). Preregistration is required—even for free classes—at newleaf.com/events. Mondays, January 22-February 12, 1-2 p.m. The free, four-part interactive workshop series, led by licensed psychologist and wellness coach Kimberly Smith-Martinez, will support those wishing to modify their eating habits for goals such as improving health, building muscle or losing weight. The approach presented can also be applied to make lasting changes to other behaviors. Participants will learn about the science behind journaling and how this can support behavior change. By the end of the sessions, participants will “track mind, mouth and muscle” and be prepared to pursue their goals. The classes are on Mondays through Feb. 12. Wednesday, January 24, 6-8 p.m.
Thursday, January 25, 6-7:30 p.m.
Wednesday, January 31, 6-7 p.m.
Join Dr. Danette Sutton and learn how to read and understand food labels and start making healthier choices. Since the FDA announced a new label for packaged foods last year to reflect new scientific information, we will discuss the link between diet and chronic diseases. Wednesdays, Feb 7-Feb 28, 6-8 p.m.
February 7: Intro to Inflammation, Leaky Gut, & Autoimmunity. In this two and a half hour class, Magali and Madia will provide a presentation on how inflammation affects the body, including what foods cause the biggest inflammatory response. Cooking demonstration & meal included. February 14: Elimination Diets: There are quite a few anti-inflammatory diets out there these days. This class will go over how to choose the right elimination diet, and what’s in a name. We will cover the Autoimmune Protocol, (AIP) Gut and Psychology Syndrome (GAPS) Wahls Protocol, Traditional Foods, and the Paleo diet to help you decide which one is the most realistic and beneficial fit for you. Cooking demonstration & meal included. February 21: Meal Planning for Success! To complete a successful elimination diet, preparation is key. Magali & Madia will go over meal planning a week at a time, demonstrating batch cooking techniques that will make throwing together dinner easy! Cooking demonstration & meal included. February 28: Hands on Cooking. In our last class together, classmates participate in creating an anti-inflammatory recipe from scratch. We will discuss techniques, resources, and do a series review plus Q &A on what you have learned from the class. Full meal included.